Generate a comfortable, stable income for yourself and your loved ones. 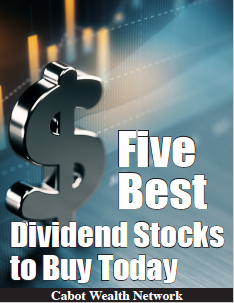 Download Cabot’s Best Dividend Stocks right now and get started with smart, profitable dividend stock investing FREE! Cabot Wealth Network, a family business established in 1970, is a trusted independent source of advice for individuals striving to take control of their investments and to find the best stocks. Cabot employees take great pride in providing our customers with intelligent investment advice and timely, personal service. We invite you to join us on the path to becoming a better, more confident, richer investor by downloading your free report, Cabot’s Best Dividend Stocks, and signing up for our free investing advisory, Wall Street’s Best Daily. To be a trusted independent source of advice for individuals striving to take control of their investments. To help our growing customer base become better investors by providing them with actionable advice that is grounded in sensible, time-tested investment strategies and by educating them on how best to use it. We value our customers, who expect and deserve our best work. We value the voice of the stock market, which keeps us humble while providing us with great opportunities. We value our employees, who, by working as a team in a respectful and ever-adapting environment, can accomplish feats impossible for any of us individually. We value honesty, not only because our independence and public reputation are major assets, but also because it’s the right thing to do. We value education as the optimum route to self-improvement. We value profits, so that our employees can be well rewarded for their efforts.